We know by now that the internet is a giant playpen, a landscape of toys, distractions and instant gratification, of chirps and squeaks and bright, shiny things – plus, to be sure, ugly, horrid beasties lurking in all the softness – apparently without horizon. Graphics – rounded corners, lower case, Google’s primary colours, Twitter’s birdie, Facebook’s shades of blue – enhance the innocence and infantilism. It is a world, as Jonathan Franzen once said, “so responsive to our wishes as to be, effectively, a mere extension of the self”. Until we chance on the bars of the playpen and find that there are places we can’t go and that it is in the gift of the grown-ups on the other side to set or move the limits to our freedom. We’re talking here of virtual space. But those grown-ups, the tech giants, Apple, Facebook, Google and the rest, are also in the business of building physical billion-dollar enclaves for their thousands of employees. Here too they create calibrated lands of fun, wherein staff offer their lives, body and soul, day and night, in return for gyms, Olympic-sized swimming pools, climbing walls, basketball courts, running tracks and hiking trails, indoor football pitches, massage rooms and hanging gardens, performance venues, amiable art and lovable graphics. They have been doing this for a while – what is changing is the sheer scale and extravagance of these places. For the tech giants are now in the same position as great powers in the past – the bankers of the Italian Renaissance, the skyscraper-builders of the 20th century, the Emperor Augustus, Victorian railway companies – whereby, whether they want to or not, their size and wealth find expression in spectacular architecture. As Deyan Sudjic, formerly of this parish and now director of the Design Museum, wrote in his book The Edifice Complex, the execution of architecture “has always been at the discretion of those with their hands on the levers of power”. Having as much sense of their own importance as those previous powers, tech companies probably don’t mind commissioning structures that define their time. A clue to their ambitions lies in their choice of architects, who are at the very to extremely famous end of the professional spectrum. They have, plainly, colossal resources, with the ability to do almost anything they like. They can have new materials invented, or make old ones perform as never before. They can build the biggest and most expensive workplaces yet seen. They can change cities. They have already redefined “architecture” in the sense that the word can now refer to the structures of software and hardware. Now the old-fashioned version of architecture finds itself an adjunct of the new sort. One sign of the shifted balance of power is the fact that Apple, having commissioned the mighty Foster and Partners to design its new HQ, chose not to name them even after they had unveiled the plans. The project is still not on the Foster website. The Apple brand had to come first. Most though not all of these new structures are in the gathering of towns, suburbs and small cities that goes by the name of Silicon Valley. 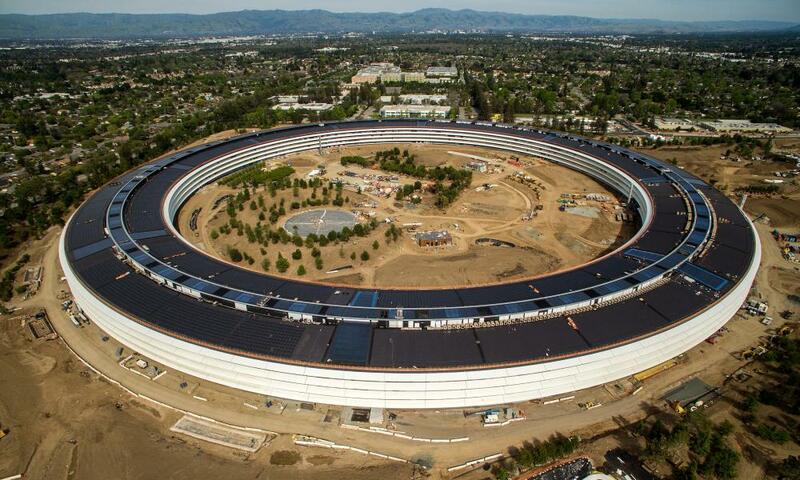 There is the Foster project, Apple Park in Cupertino, 2.8m sq ft in size and reportedly costing $5bn, at its centre a mile in circumference, visible from space, a metal and glass circle that is now nearly complete. There are the planned Google headquarters in Mountain View and London by the high-ego, high-reputation pairing of Bjarke Ingels and Thomas Heatherwick. 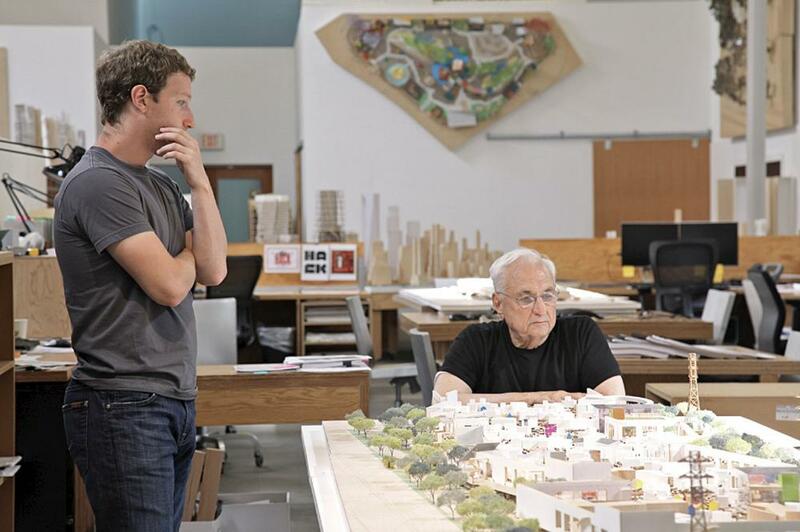 Facebook has hired the New York office of OMA, the practice founded by Rem Koolhaas, to add to the Frank Gehry-designed complex in Menlo Park that was completed in 2015. The one that commands most attention, and has done since the designs were unveiled in 2011, is the Apple/Foster circle, built on a site vacated by the waning empire of Hewlett Packard, which as it happens was the company that gave the teenage Steve Jobs his first break. According to Wired magazine, the building preoccupied Jobs in his last months, and he would spend his precious time on five- or six-hour meetings on its design. In June 2011, visibly ailing, he appeared in person in front of a starstruck Cupertino city council, with members of the audience snapping him with what now look like Jurassic cameras, to convince them of its merits. He didn’t have to try too hard. “We’ve had some great architects to work with,” he said, “some of the best in the world I think, and we’ve come up with a design that puts 12,000 people in one building.” The audience gasped. He’d seen “office parks with lots of buildings” but they “get boring pretty fast”. So he proposed, introducing a metaphor that has since stuck to the design like dust to a MacBook screen, something “a little like a spaceship landed” with a “gorgeous courtyard in the middle”. “It’s a circle and so it’s curved all the way round,” he said, which “as you know if you build things is not the cheapest way to build something. There’s not a straight piece of glass on this building.” At the same time the height would never exceed four storeys – “we want the whole place human-scale”. There would be 6,000 trees on the 150-acre site, selected with the help of a “senior arborist from Stanford who’s very good with indigenous trees around this area”. When a council member said that “the word spectacular is an understatement”, Jobs didn’t demur. “I think we do have a shot at building the best office building in the world,” he said. “I really do think that architecture students will come here to see this, I think it could be that good.” He batted away mild requests for a few perks for the neighbourhood – free wifi, opening an Apple store, mitigating the increase in traffic – and in the nicest possible way reminded everyone that “we’re the largest taxpayer in Cupertino, so we’d like to continue to stay here and pay taxes.” If the city asked for too much, in other words, Apple would decamp to a rival municipality. The mayor waved an iPad 2 (which also looks Jurassic now) and said how much his daughter loved it. “Your technologies really make everybody proud,” said another council member. “Well thanks,” said Jobs, “we’re proud to be in Cupertino too.” “Thanks,” she gurgled back, like a giddy teenager. In due course the project was approved. Jobs was in fact understating the circle’s exceptionalness. Recently Steven Levy, a journalist for Wired, was let through Apple’s PR palisades to look inside the nearly-finished building. He described a high-precision Xanadu, a feel-good Spectre base, on which Lord Foster and his team were assisted by Apple’s famed chief design officer – also, as it happens, British-born – Sir Jonathan Ive. After a drive down a pristine 755-foot long tunnel, clad in specially designed and patented tiles, he discovered a world of whiteness, greenery and silver, with a 100,000 sq ft fitness centre and a cafe that can serve 4,000 at once, with the 1,000-seat Steve Jobs theatre, surmounted by a 165ft-wide glass cylinder, for Apple’s famous product launches, and with a landscape designed to emulate a national park. It is a place where trees have been transplanted from the Mojave desert, where the aluminium door-handles have been through multiple prototypes to achieve their perfect form, where the stairs use fire-control systems borrowed from yachts, where the extensive glass has been specially treated to achieve exactly the desired level of transparency and whiteness, where even a new kind of pizza box that stops the contents going soggy has been invented and patented for the company cafe. The doorways have perfectly flat thresholds because, according to a construction manager reported by Reuters, “if engineers had to adjust their gait when entering the building, they risked distraction from their work”. In life Jobs was ferocious about the detail; since his death his followers have striven to be true to his spirit. He specified how the timber wall-linings should be cut and at what time of year, to minimise its sap content. There is a yoga room, reports Levy, that is “covered in stone, from just the right quarry in Kansas, that’s been carefully distressed, like a pair of jeans, to make it look like the stone at Jobs’s favourite hotel in Yosemite”. There are the sliding glass doors to the cafe, four storeys or 85 feet high, each weighing 440,000 lbs – nearly 200 tonnes –, that open and close with the help of near-noiseless underground mechanisms. Apple Park uses the largest, heaviest single pieces of glass ever installed on a building, with the added complication of being curved. It is certainly a wonder of our age, though to what end is an open question. Jonathan Ive told Wired that the main aims were the connection and collaboration it would allow between employees. For Foster it is “a beautiful object descended on this verdant, luxurious landscape … a true utopian vision”. One of its aims is to inspire future Apple workers with its perfection and attention to detail, to set a standard for them to follow in their work. Tim Cook, Apple’s CEO, called it a “100-year decision”. Ever since the design was unveiled, however, it has provoked scepticism. The architecture critic of the LA Times called it a “retrograde cocoon”, “doggedly old-fashioned”. As a perfect and excluding piece of modernist geometry, set within lush planting and dependent on large amounts of car parking, it looks oddly like a corporate HQ of the 1950s or 60s, something that IBM or Bell Labs might have built, which you would have thought is exactly the look Apple wouldn’t want. And a circle is a frozen form, hard to modify or augment. At any given point, the relationship to the rest is much the same as at any other point, which seems to work against Ive’s hopes for communication and spontaneity. It is the shape of infinity and eternity, of mausoleums and temples. Many of the greatest inventions in modern technology have been made in rough and ready, easy-to-adapt spaces – in the garages, front rooms and borrowed office desks where Apple, Google and others were hatched and in Building 20, the big wooden shed at the Massachusetts Institute of Technology where major advances were made in linguistics, nuclear science, acoustics and computing, to name but a few. And while it’s impossible for a company the size of Apple to recreate that exact spirit in its workplace, the big circle does look over-determined and too complete, as well as expensive and slow to build. Foster’s “beauty” and “utopia” may not make the best environment for fast-moving invention. As for Cook’s 100-year ambition, this seems strange and hubristic – as the decline of Hewlett Packard shows, there is little reason to think that any tech company can last that long, in which case the Apple circle will, like the crumbling art deco skyscrapers of Detroit, be magnificently redundant. There is another line of criticism, which is that those awed and tax-hungry members of Cupertino city council didn’t push hard enough for the help that their community needs. If the presence of Apple is mostly an immense boon for them it also brings pressure on housing and transport, creating traffic jams and long commutes and pushing the median price of a home in Cupertino to nearly $2m. The design writer Allison Arieff recently argued in the New York Times that the project shows a “blatant disregard not only for the citizens of Cupertino but also for the functionality of the region”. It should, she says, have made more effort to connect to public transport and the city should try harder to address the housing need that Apple’s presence generates. It doesn’t often pay to bet against Apple’s judgment, and there may be intelligence in the project that is not visible in the available information. The company’s wealth and power may in any case be enough to counteract any unhelpfulness in its architecture, but Apple Park looks like the sort of splendid monument that empires build for themselves – Lutyens’s buildings for the British Raj in Delhi, the skyscrapers that went up on the cusp of the Wall Street crash – after they have passed their supremacy. It may also be governed by excessive if understandable respect for Jobs. It is a place imbued with his biography and his dreams. They call it “Steve’s gift”. It had better not be Steve’s millstone. Shohei Shigematsu, the partner at OMA New York in charge of Facebook’s latest expansion, Willow Campus, says that “our mission was not to provide iconic architecture but also regional and social thinking”. He and his client, he says, want to “integrate with community and provide community amenity”, to provide “the things that the community desperately wants” – a grocery store, open space, 1,500 homes of which 15% will be offered at below market rents, a hotel, greenways, residential walks, shopping streets. “Facebook is the perfect company,” Shigematsu also says, “their mission is to connect people, and network is a word that is virtual but also physical.” So he wants to apply that mission to “urban ambitions for connectivity in the Bay Area”. He wants to re-activate a disused rail corridor at the edge of the site as a cycling track, a pedestrian route and a possible line for a Facebook shuttle that can also be used by the public. He wants to “undo the corporate fortress-like approach”, although he acknowledges that a vast company will always have secrets and that much of its territory will be out of bounds to the general public. The imagery published so far shows generically pleasant parks and streets, of the kind that well-mannered urbanists have been generating for more than three decades, with none of the provocation, surprise and signature perversity that you usually get with OMA projects. Shigematsu says he is happy to accept “a certain level of banality” in the appearance – it is the “large-scale thinking” that matters to him. Google want something else again. They’re definitely not afraid of icons. After considering various architects – Zaha Hadid, for example – they shotgunned Heatherwick and Bjarke Ingels’s practice, BIG, into a marriage. It’s a striking idea, like a billionaire hiring Miley Cyrus and Britney Spears to perform at his sprog’s 18th birthday. Heatherwick and Ingels are among the younger recruits to the ranks of iconists, unabashed showmen, purveyors of WTF spectaculars untrammelled by the intellectual scruples of older architects. One of the two might be considered ample for any one project, but then businesses like Google don’t play by normal rules when it comes to hiring designers, or indeed much else. At Mountain View, where permission was recently granted to proceed, a huge roof is proposed, both mountainous and tent-like, with upward-curving openings – “smile-shaped clerestories” – for viewing the sky. Beneath its capacious shelter, on a raised open deck, hundreds if not thousands of Googlers will be doing their stuff. The next level down a publicly accessible route runs through, part of a programme of engaging with the local community that also includes a “public plaza” for group tai chi and whatever. It is framed by “oval oak thickets”. If Apple Park seems aloof and extraterrestrial – despite the fact that quite a lot of its landscape is open to the public – then Facebook and Google want you to know how much, like street jugglers or mime artists, they want to engage you. But there are also similarities between all these projects, such as the all-embracing nature of their ambitions. Each campus is a self-contained universe where everything – the species of vegetation, the graphics, the food in the cafe, the programming of events, the architecture, is determined by the management. They make their own weather. Under the Google tent or inside the Apple circle there is little but googleness or appleness. There is nature but – despite the meticulous selection of native plants – it is of an abstract, managed kind. There is art, but it is drained of the power to shock and subvert, leaving only diversion and reassurance. There is architecture but, notwithstanding the high degree of invention that goes into materials, it finds it hard to shed the quality of computer renderings, the sense that buildings are made of a kind of digistuff, which could as well be one thing or another. Even when the corporations reach out to their communities, to use the preferred PR terminology, the rest of the world is a hazy, ill-defined entity, a mist in the background of the computer-generated images. These panoptical worlds are a function of the sheer scale of the corporations, but they also reflect their mindset. It has been pointed out that tech campuses resemble hippie communes of the 1960s in their apparent egalitarianism, their illusion that you can go back to nature, make your own rules, liberate yourself with science and share everything. Physically, Google’s big roof echoes the geodesic domes that hippies put up in their rural retreats. While their sci-fi is strangely dated, culturally it makes sense. As the author Fred Turner has argued in From Counterculture to Cyberculture, radical Californian ideas of the 1960s were, with added profit motive, converted into radical Californian technologies of recent decades. And as has been belatedly dawning, there are limits to the sharing, equality and freedom, particularly when the intellectual property and business strategies of the tech giants are at stake. Their architecture gives form to these contradictions, to the combinations of openness and control and of freedom and barriers. They are perfect diagrams of the apparent equality and actual inequality of the tech sphere, where impermeable septa divide those in the inner circles from the rest. There is inequality everywhere, of course, but the tech trick is to pretend that there isn’t. 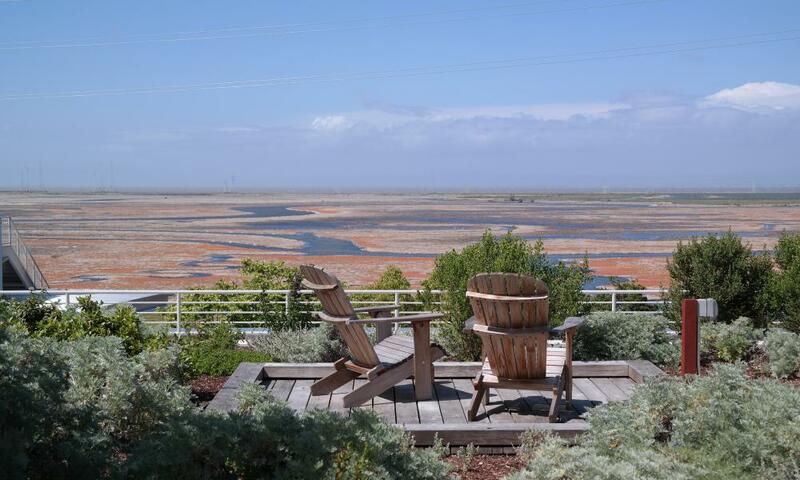 Sometimes tech HQs find themselves in the middle of big cities, rather than the compliant sprawl of Silicon Valley, which causes them to modify but not abandon their hippie-commune mentality. 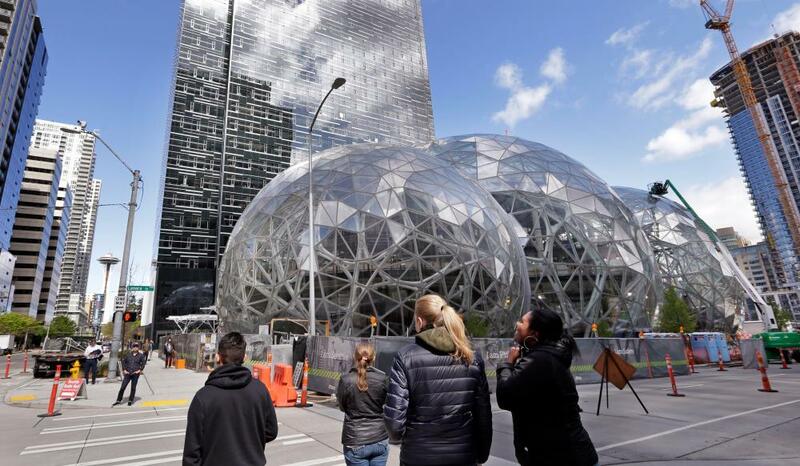 Amazon has chosen to situate itself in downtown Seattle, where it is believed to occupy 15-20% of the available office space, which allows it to boast that 20% of its 25,000 employees walk to work. To its fairly anodyne assembly of office blocks it has just added the Spheres, an urban Eden Project of interlocking bubbles, where its employees will wander, in Costa Rican temperatures, among tropical forests and waterfalls. 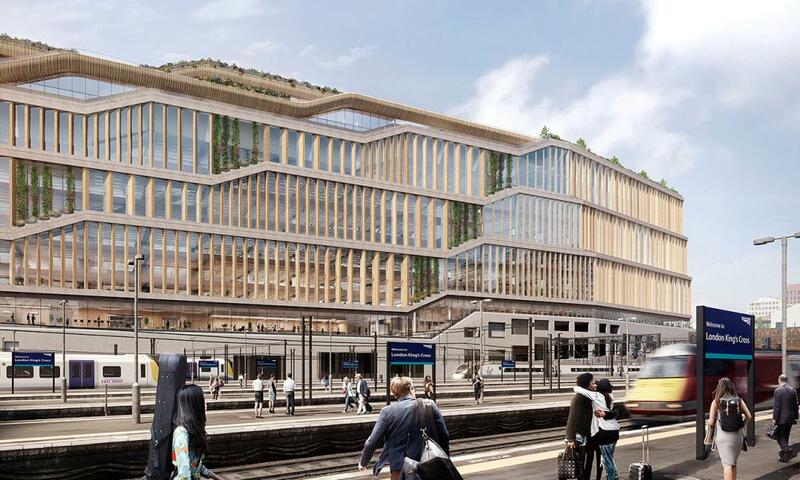 At King’s Cross in London pressure of space has obliged the stacking-up of Google’s campus into an 11-storey, one-million-square-foot structure as long as the Shard is tall. Here the fun and games of the inside – a promenade that ascends past cafes and fabulous sports facilities to a rooftop landscape of “headland”, “fields”, “garden” and “plateau” – are compressed into an exterior that takes its cue from the somewhat po-faced regularity of office blocks around it, and from the repeating lines of the railway tracks down one side. These rhythms then get jiggered, as if the internal energy can’t be contained any longer. The proposed building is one of the more convincing architectural designs so far by either BIG or Heatherwick, in which the encounter of campus and metropolis generates compression and tension, pushing and pulling, action and reaction. It is also a decisive structure, unafraid of its scale, amid the more hesitant blocks around, which is something the area needs. But it is still inward-looking, offering a conventional office entrance plus an array of retail units to the street. If the same can be said of other office buildings nearby, one could have hoped that the force of Google could have achieved more. When Microsoft was in its pomp it was happy to occupy a bland scattering of low buildings on the edge of Seattle. It still does. It’s also striking that for all its fame Silicon Valley makes little impression on the visual consciousness of the world – there’s not a strong sense of what it actually looks like. Until now it has lacked landmarks. But that much power and that much money will not always be happy to be unobtrusive. We are only just beginning to see the ways in which it can change the landscape of cities.